Sterling Silver Jerusalem Plaque Fabulous artisan sterling silver (NOT silver plated) Jerusalem plaque, Judaica. 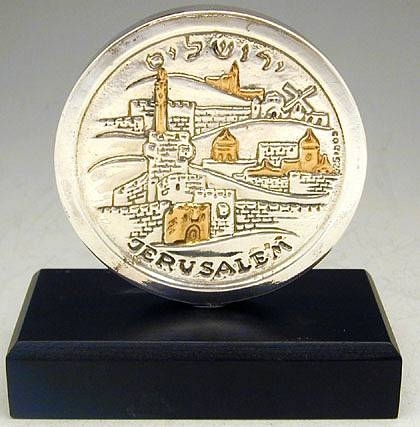 The round plaque is beautifully adorned on one side with a superb depiction of the Holy city Jerusalem, inscribed in Hebrew and in English Jerusalem . 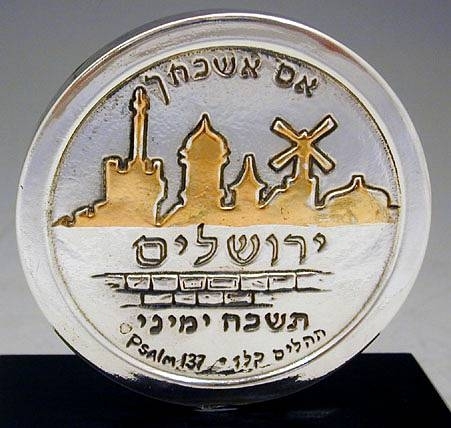 The other side is inscribed with the famous Hebrew phrase I´m Eshkahech Yerushalim, Tishakach Yemini . Set on a rectangular black wooden base. This item was made in the electroforming method. Measurements: Height: 10cm. / 3.937in. Diameter: 7.8cm. / 3.071in. Base: 9.8cm. x 5cm. / 3.858in. x 1.969in. Weight: 110gr. / 3.537oz. Marks: 925 for sterling silver.